From his birth in a Texas hill country town that no longer exists, Weldon L. Kennedy has come a long way. After service as a naval intelligence officer, he joined the FBI in 1963. Over the course of four decades, he served the Bureau with distinction, exemplifying the cutting-edge of crisis management. Unfortunately, due to sales rights restrictions, we cannot offer On-Scene Commander for sale in your country. From his birth in a Texas hill country town that no longer exists, Weldon L. Kennedy has come a long way. After service as a naval intelligence officer, he joined the FBI in 1963. Over the course of four decades, he served the Bureau with distinction, exemplifying the cutting-edge of crisis management. In 1987, he earned fame as the on-scene commander during a riot at the federal prison in Atlanta, where he negotiated an end to a violent thirteen-day siege—without any loss of life. His skillful management of the Oklahoma City bombing case led to the quick arrests of Timothy McVeigh and Terry Nichols. 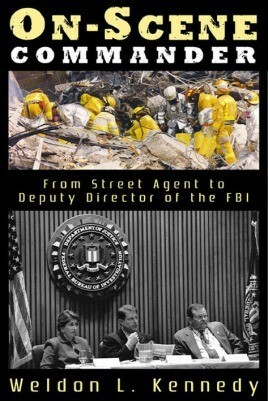 Kennedy capped his brilliant career by serving as the FBI's highest-ranking official under Director Louis J. Freeh. Imparting a wealth of law enforcement experience and of wisdom about how to succeed at a job one truly loves, On-Scene Commander is for anyone with an interest in the real world of the FBI.